Sphere Exhibits is a leading regional M.I.C.E company behind exciting and innovative fairs, shows, events and exhibitions for trade and consumer businesses in Asia. Join high quality events in the F&B, retail, beauty, finance, gaming, motoring and education sectors. Meet prospective business partners and keep your company updated with these industry leading events. Continually improve yourself and your business through these professional conferences. Drop us a line, come over for a chat. We are always here for you. Being at the right place at the right time can spell success for your business. Sphere Exhibits links you to a dimension of immense possibilities, where people and ideas converge to create great shows and events to bring out the best in your business. 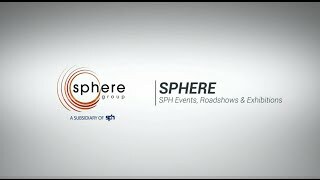 Incorporated in April 2008 and wholly owned by Singapore Press Holdings (SPH), Sphere Exhibits, stands for “SPH Events, Roadshows and Exhibitions”.